I’m not sure if I’ve mentioned it before but I’m not a huge fan of romance novels/chick lits. That doesn’t mean one doesn’t manage to get my attention but it’s very rare. 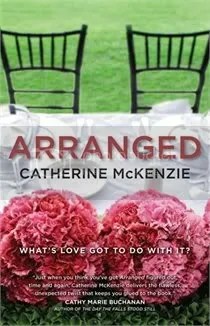 Especially finding one that I actually enjoy… Now, the reason why I picked Arranged up was because I really enjoyed Catherine McKenzie’s first novel Spin. I thought, Hey, why not? I didn’t hate Spin so what are the chances of me disliking this one? Getting right into it. My first impression of the book was: nice cover, not one of my favourites but good enough. The tag line: “What’s love got to do with it?” didn’t do anything for me. The summary did seem to work well enough though; it was the “not what they seem at all” that really got me. By the time I got through the book (6 hours) I can tell you that I was feeling extremely disappointed. I’ve been meaning to write this review for the longest time but that feeling seemed to get in the way and every time I tried to write this I’d just sigh. Defeated. Don’t get me wrong. It’s not a terrible book and there are some moments that I enjoyed but (there’s always a but isn’t there?) it could have been better. See, as I mentioned a bit earlier, the “not what they seem” is what caught my attention, so with this information you, as the reader, already know something is going to go wrong. You flick page after page and you’re waiting and waiting. I won’t tell you what happens (as sorely tempted as I am), but I will tell you that the big conflict only arrived near the very end of the novel and in my opinion a little predictable. Maybe if the summary hadn’t mentioned there would be a twist, I wouldn’t have been waiting for this (maybe) big thing to happen. Alas… since I did know something was supposed to happen, I kept trying to figure it out and I got impatient waiting for the event to arrive. In the end, this event didn’t live up to any of my expectation and utterly disappointed me. Now that I know what happens, I might go back for a second read with a fresh mind. See if I can enjoy the middle more since I have nothing to feel impatient about. We’ll see. I’m giving Arranged 2.5 cupcakes. No sprinkles on the icing unfortunately (maybe after a second read). It wouldn’t be the first book I’d put on a recommendation list but I wouldn’t black-list it either. This entry was posted in 2012, Reviews and tagged Arranged, Book Blog, Book Reviews, Books, Catherine McKenzie, Chick Lit, literature, Romance, Sam, Words for Dessert by dreamingwithink. Bookmark the permalink.